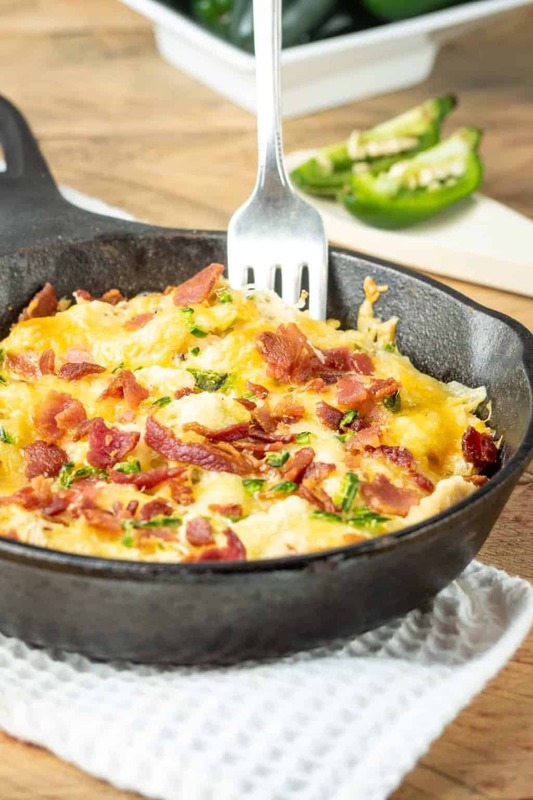 WHAT IS JALAPENO POPPER BAKED CHICKEN SPAGHETTI? 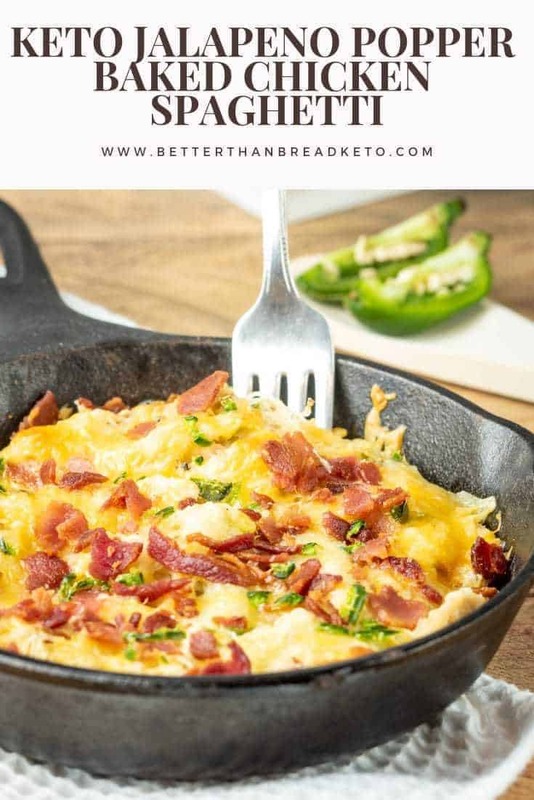 Keto jalapeno popper baked chicken spaghetti is a delicious dish that combines the spice of jalapenos with the deliciousness of chicken and cheese. This dish makes a wonderful meal for any time of the year and is sure to please everyone. This delicious, cheesy dish is easy to make and calls for simple ingredients to make it. Most of the ingredients needed are (generally) keto kitchen staples, so hopefully, you will hopefully have most of it on hand. 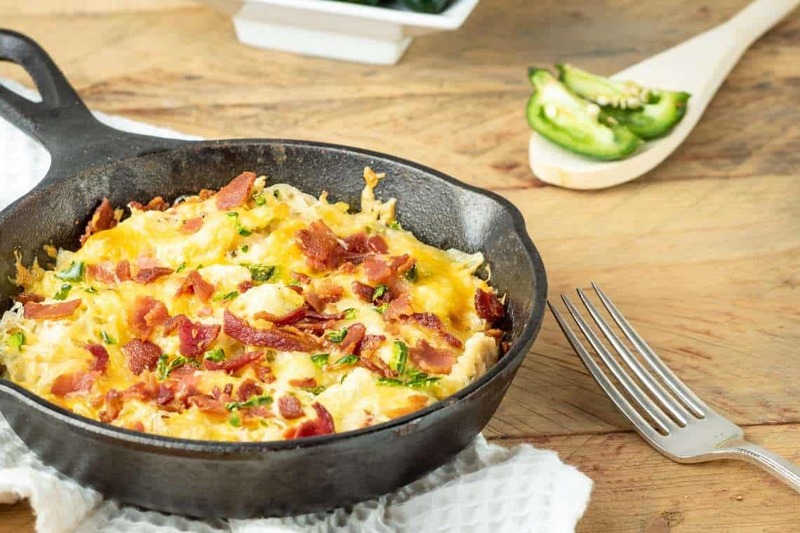 Do take note of the multiple kinds of cheese needed… They make this dish super cheesy and absolutely delicious! Grab whichever of these ingredients you don’t have from the store and you’re ready to go! WHAT KIND OF SHREDDED CHICKEN SHOULD BE USED? Any kind of cooked chicken that has been (or can be) shredded is usable in this dish. Here are a few ideas for you if deciding what kind of chicken you should use. If you are looking for the easiest, most delicious kind of chicken to buy for this, grab a small, fresh rotisserie chicken from your grocery store deli. These chickens are, of course, pre-cooked, which means you can have juicy, delicious chicken without having to cook it yourself. Rotisserie chickens usually also provide for some chicken to be left over, which is easy to refrigerate and use again in another recipe! If you don’t have rotisserie chicken on hand or can’t get one at the store, canned chicken is an alternative. It certainly won’t taste as fresh or be as juicy and yummy, but will still work in a pinch. There are multiple brands of canned chicken that range in price, quality, and taste. If you don’t have a brand you know and love, it would be a good idea to buy a few small cans and find the one you like the best first. The most time intensive option is to cook a chicken at home. Depending on your local stores, you can find these fresh, refrigerated, or frozen. The methods you use to cook the chicken are up to you. If you choose this method, you are probably well-versed in cooking a chicken yourself and have a method that you prefer the most. 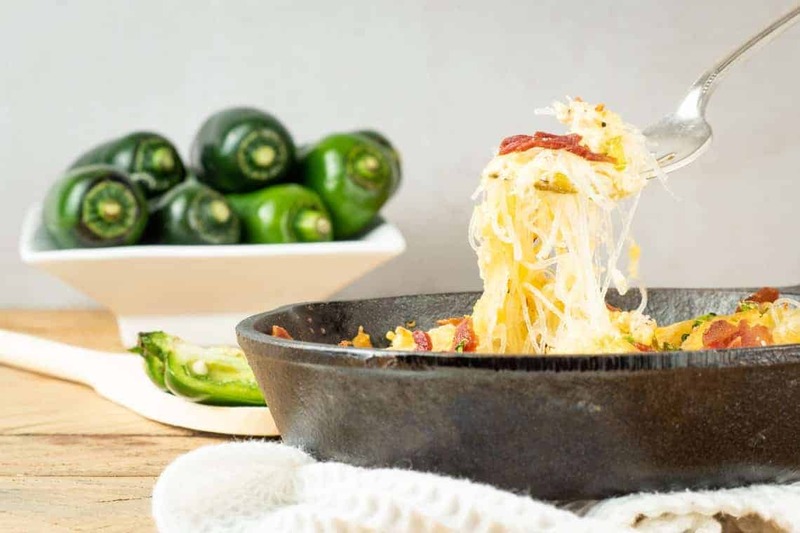 While it might seem like a pretty complicated dish to make, making this keto jalapeno popper chicken spaghetti is pretty easy and straightforward. Grab the ingredients from above and follow these instructions to make this delicious meal! Begin by preheating the oven to 350˚F. Fry the bacon until crispy and set aside on paper towels to drain and crisp further. Add minced garlic, diced jalapenos (seeds in for more spice or seeds out for a milder spice), and butter along with the bacon grease. Fry garlic and jalapenos until fragrant. This doesn’t take too long, so be careful not to burn it! Add cream cheese, heavy cream, fresh ground black pepper, chicken, and half of each of the other cheeses to the skillet. Stir ingredients together to mix and remove from heat. Drain and rinse the shirataki noodles and add to the skillet mixture. If you are wanting to use a different noodle for this dish, read on below for some ideas! Transfer to a baking dish (unless you have been using a cast iron skillet up until now) and top with the rest of the cheeses. Bake for 10 – 15 minutes or until the cheese is melted and starting to brown. Remove from oven, serve, and enjoy! WHAT PAIRS WELL WITH THIS DISH? There are several great side ideas that would go great with this recipe. Here are some ideas to help you out! WHAT NOODLES CAN BE USED? We recommend using shirataki noodles. If you aren’t familiar with them, these noodles are made from the root of konjac yam. The word shirataki itself means white waterfall, which is a very accurate description of the appearance of the noodles. In the United States, these noodles are normally found packaged in water. They are great for those on keto/low-carb diets because they are made up of water and glucomannan, which is a soluble fiber. They are very, very low in digestible carbohydrates. I made major adjustments to the calorie load on this one. I have to stay under 1100 calories a day. I cut all cheese (including cream cheese) in half. I used half as much heavy whipping cream and I used only 1 jalapeño and 6 slices of bacon. Turned out AMAZING!!! I also subbed zoodles in for the noodles to get my phytonutrients. (I used 2 medium zucchini). I saved this recipe and will make it over and over!! Super yummy! Thank you for giving me a place to start with another delicious meal. Glad you were able to make adjustments to fit your needs and that you enjoyed the recipe! 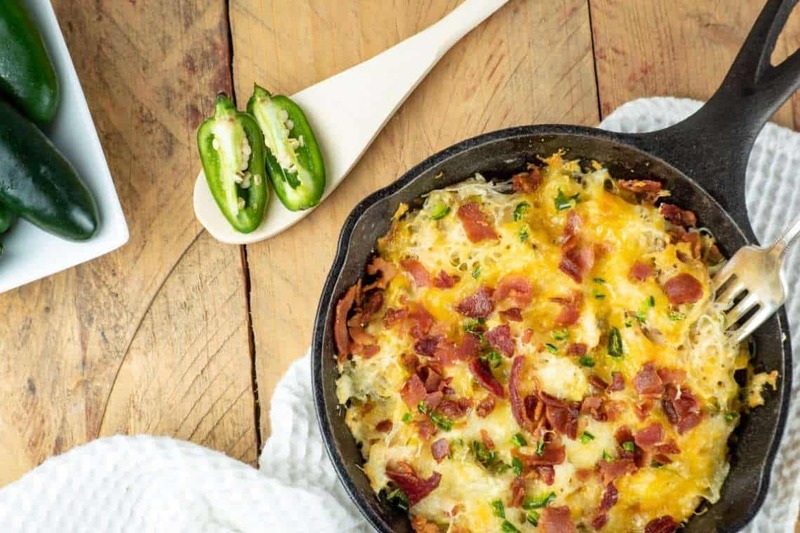 I love that you incorporated jalapenos into this recipe! I think it’s a nice touch, I want to make this recipe for the weekend, thank you!